Pandanda - Henry's Blog: Zing's Third Prize! It's Monday, which means Zing Ballyhoo has a new prize for you! This is the last prize he will have before he packs up his tent and leaves Pandanda to travel the world looking for new prizes. 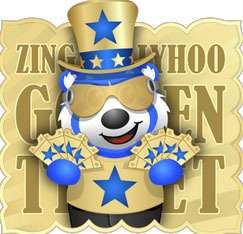 To get Zing's prize, just collect 10 Golden Tickets that he has hidden all over Pandanda (except in treehouses, of course!) Once you have 10 Golden Tickets, pay a visit to Zing at Tree House Lobby. He will give you a choice of either his prize, or a sack full of coins. Choose carefully, because you can only choose one! Mark your calendars for Orange Color Day this Wednesday, October 10th. We want to turn all of Pandanda as orange as a Halloween pumpkin, so make sure you have Orange Panda Paint, and check your closet for all of your orange clothes and accessories! I think Orange Day was the very first Color Day we had in Pandanda, way back in 2010. What a great tradition!